Prof. Isidor Rosenthal 1837-1915. He was married to my great gandmother’s sister and taught physiology at the University of Erlangen. My great grandmother’s sister, Anna Höber, married Isidor Rosenthal in 1869. He was a professor of physiology at the University of Erlangen and became the mentor to my grandfather, Rudolf Höber, who also became a professor of physiology in Kiel and Philadelphia. Anna Höber Rosenthal’s groundbreaking social reform work in maternal and child care and public health resulted in a street being named for her in Erlangen. 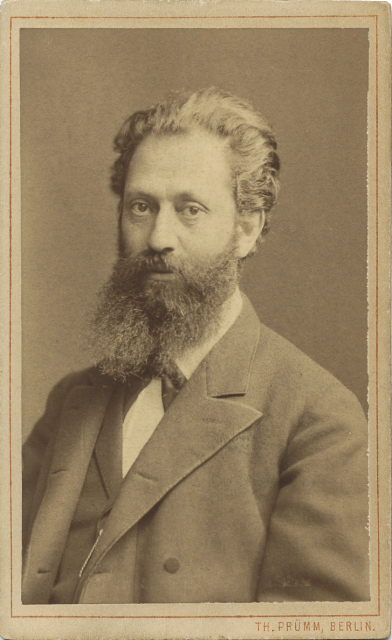 In 1870, Isidor and Anna had a son, Werner Rosenthal, who grew up to become a professor of pathology at the University of Göttingen, as well as an activist for education reform. In 1915, Werner married Erika Deussen, daughter of the great Sanskritist and Indologist Paul Deussen. They eventually had three daughters, Ruth, Eva and Beate. 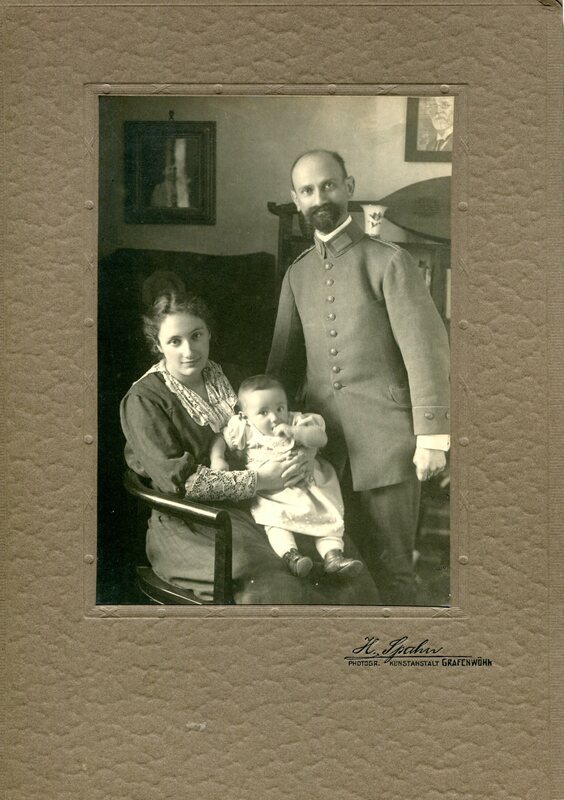 Werner Rosenthal and Erika Deussen Rosenthal, with their daughter Ruth, 1917. This was during World War I and Werner is wearing the uniform of a German Army doctor. Despite the fact that Werner was a practicing Protestant all his life, the Nazis removed him from his university teaching duties in 1934 because his father was born Jewish. Erika, a government physician, also lost her job. With no means of earning a living in Germany, Werner and Erika emigrated to India with their eldest daughter (the other two followed later). Erika had connections in India because her father had studied Sanskrit and Indian religion there. Werner became a professor at the University of Mysore and Erika practiced medicine. When World War II began in 1939, the British colonial government incarcerated Werner as an “enemy alien” and he died in a prison camp in 1942. In the 1950s, Erika and two of her daughters, Eva and Beate, moved to the United States. I met them when I was a boy. The third sister, Ruth, had moved from India to Israel in 1938 or 1939, shortly before the War. There she met and married Hubert Sommer, a Jewish refugee from Austria. Although my parents kept in contact with Eva and Beate for many years, and although I exchanged letters with Beate until shortly before her death in 2004, I knew nothing of Ruth, other than that she lived in Israel. Then, in November 2014, I was conducting some Internet research and stumbled across a genealogical website with tons of information about her and her descendants. I discovered that Ruth had three children, nine grandchildren and a dozen great-grandchildren. All at once I had 30 new Israeli cousins I had never heard of! I began an email exchange with several of the family and even got a phone call from one of these distant relatives. I was delighted to be able to provide them with references to biographies of Isidor Rosenthal and Paul Deussen and a book that detailed Werner Rosenthal’s work in support of adult education. This spring, my cousin Yoel Sommer, Ruth’s son, along with his wife Gina and his son Ishay, traveled from Israel to Germany to visit the sites that had been home to their family generations ago. I was able to connect them with writers and academics who have studied and written about the family members who preceded them. My academic friends were able to tell Yoel and his family pieces of their family’s history they previously did not know. 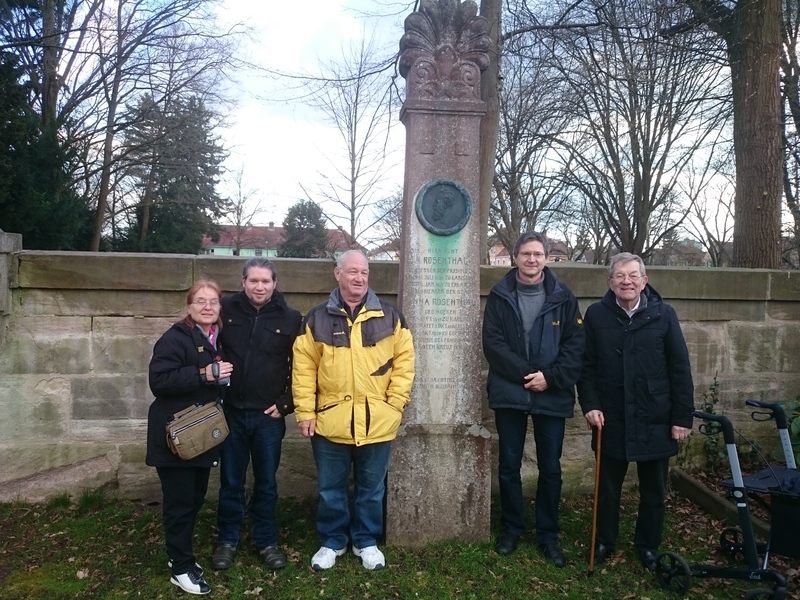 The Sommers were able to visit the well-preserved grave of Isidor Rosenthal in Erlangen, the grave and little museum dedicated to Paul Deussen in Oberdreis, and the house in Göttingen where Werner and Erika once lived. As it happened, their visit coincided with the centennial of the death of Isidor Rosenthal. Without being there myself, I was moved by the reuniting of this family with the places from which their ancestors originated — reunited over space and time, and through tragedy and history. 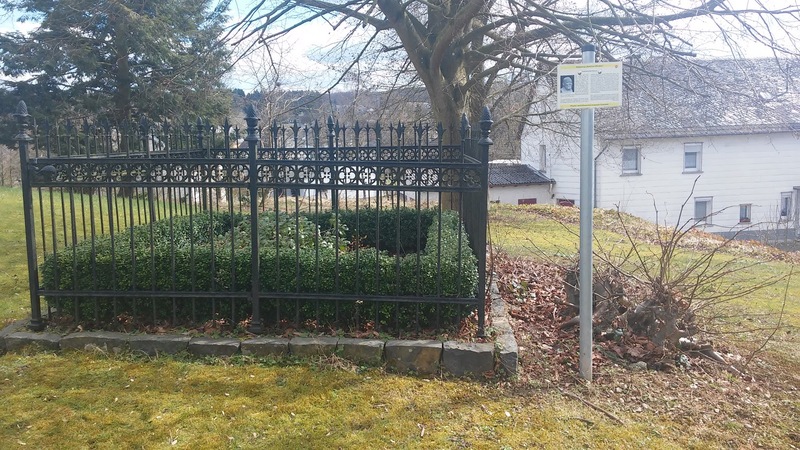 Grave of Paul Deussen in Oberdreis visited by the Sommers, April 9, 2015, accompanied by Deussen’s biographer, Heiner Feldhoff. Prof. Deussen was Yoel Sommer’s great-grandfather.